The workshop that Drew Mackie and I ran last week, exploring how to help people adopt digital technology, is part of a suite of games and other methods we are developing, with Sangeet Bhullar, under the title of Living Lab. I wrote then that I would explain further – so here goes. The Lab idea follows on, in part, from work we did for Nominet Trust on the usefulness of technology at different time of life: firstly for young people, and then for later life. We now have a proposal in with their funding challenge on technology during life transitions. I’m naturally delighted that we are through to the second round. As well as filling in the appropriate forms we were asked to provide a short video, which is here. I confess I left it rather to the last minute – but the Trust were very helpful in saying they wanted enthusiasm rather than high production values, so I hope it does the job. Drew provided the illustrations. Define connections between individuals, groups and agencies. Here’s the document supporting our proposal. The Living Lab is a space to explore, online and face-to-face, how we can use personal technology to make the most of life, at whatever age. Our two explorations for Nominet Trust showed the importance of digital technology for young and older people, particularly at times of change. We distilled common principles for policy and investment from a wealth of examples, heaps of research, and scores of innovative projects. But general principles are of little practical use in finding what might work for an individual, their friend, children, or elderly parents. The reason is that everyone’s needs, skills, circumstances and preferences are different, so one digital size doesn’t fit all. Outside organisational systems, all technology adoption is personal. If people can’t understand and choose, they can’t enjoy the benefits. And being smart with computers doesn’t mean you necessarily have the digital literacies needed for meaningful and safe online participation for young and old online, or can advise and support people on smartphones and tablets. How can organisations, that are aiming to help, understand diverse personal needs, match those with rapidly changing technology, and scale up support? How do we ensure that all those involved in providing support to others also have the necessary digital literacies to inspire and engage young and old to develop their own knowledge, understanding and personal learning journeys (online and offline)? What might these look like and what are the digital literacies needed by all involved in the process, to create a supportive ecosystem, able to respond to individual and diverse needs and interests? How best should this be delivered? The Living Lab provides a way for individuals, groups and organisations to explore these issues, learn about possibilities, and plan ways forward. Over the past 30 years, working in community engagement and social technology, Drew Mackie and David Wilcox have found three approaches that work well. 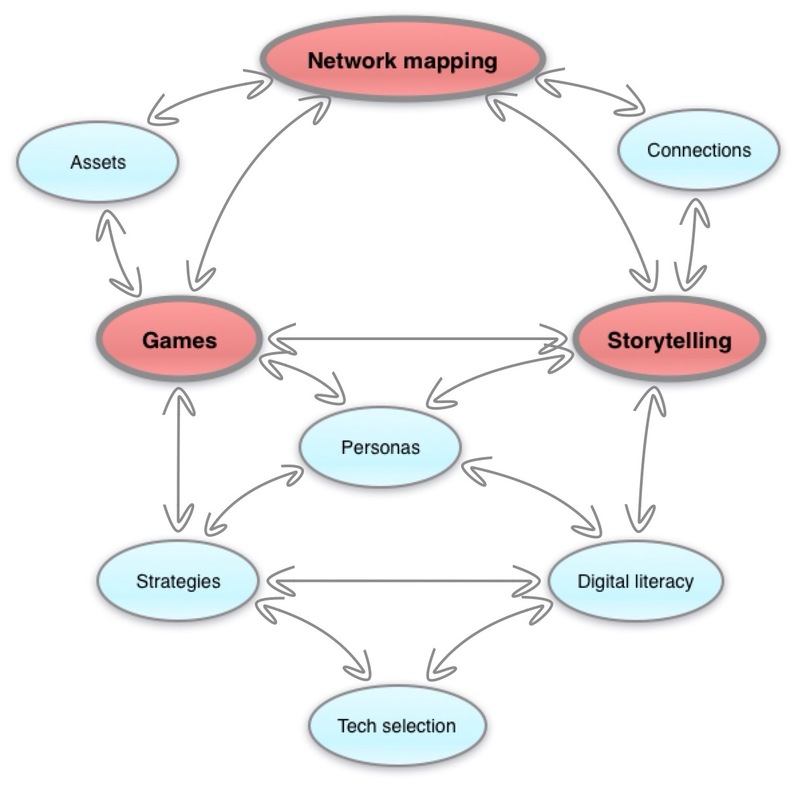 Firstly, games enable people to play through possibilities. Secondly, stories make the use of technology human. Thirdly, networks enable learning together. The Lab will add another dimension by combining these three elements with the essential ingredient of digital literacy. In the last 20 years, Sangeet Bhullar’s work has focused on supporting adults and young people to develop a critical and meaningful understanding of online spaces, services and communities (referred to here as digital literacy), as well as the necessary digital competencies needed to benefit from these online communities and services, and use them safely. Together we are creating a suite of workshop games about choosing and using technology, developed from experience over the past 15 years. These are linked with group storytelling techniques designed to bring to life a range fictitious characters and their experiences. We will use some elements of the game as well as stand-alone exercises to help explore and develop the baseline and other digital competencies needed for positive and safe online experiences. We have developed the fictitious town of Slipham, populated with some engaging characters and supportive organisations, to provide the context for the games, stories and the way networks and digital literacies can develop. Slipham also provides a set of networks through which the various connective needs of individuals, community groups, enterprises and agencies can be explored. Existing assets (skills, equipment, premises, organisational structures, etc) are also modelled. A DIY system that can be used face-to-face and online by anyone without our support. An open process of gathering stories, situations, and methods to foster a network of people interested in further development. An open source framework within which others can add or develop solutions. A space to explore the digital literacies needed for effective online use, and the implications of the move towards personal, mobile, “appified” technology solutions. We already have a range of workshop materials that can be developed for DIY use. We have started to build a site where workshop cards provide a design framework to link through to more resources onsite and elsewhere. Here’s some of the work that we have done that underpins our approach. The Digital Practitioner – Digital Leader Programme Collaborative Blog – a collaborative blog developed for a ‘Digital Leader’ programme to support Community Digital Inclusion workers and volunteers develop their own knowledge, skills and digital literacy so that they could, in turn, provide better support to their organisations, peers and service users in their use of online technologies. Update April 10 2014: we have now learned that we were unsuccessful in the bid to Nominet Trust, who said “although we were incredibly inspired by your proposal, we are simply unable to fund all of the high quality applications we receive.” However, we do have a number of projects through which we are starting to build elements of the Lab, and will be seeking investment elsewhere. Posted on February 3, 2014 by david wilcox. This entry was posted in All posts and tagged games, living lab, Networks, storytelling. Bookmark the permalink.